Jannie Regnerus and Roy Villevoye were both educated as painters. Within the discipline of painting they have adopted a (self- ) reflective approach that has led to particular interpretations of art and artistic practice. Their analysis and conceptualization of the painting process and the position of the artist has resulted in them extending their studios - the place from which they operate - into the world outside. This links their own pictorial concerns with a broader conception of painting which has been the focus of much attention over the last few years in such exhibitions as 'Am rande der Malerei' ('On the Edge of Painting'), Berne 1995. Jannie Regnerus performs pictorial acts in the 'still landscape' of the Netherlands, as well as in Japan and Mongolia, while Villevoye travels to India and Irian Jaya in Indonesia where, in the meeting of other visual cultures, he is able to regard his own in a different light. The first two works the visitor encounters on entering Stedelijk Museum Bureau Amsterdam direct the eyes to the ground. On the wall is a photograph by Regnerus showing how, the day before the opening, she took the 'blossom' she had cut out of coloured paper throughout the year and kept in plastic bags in her studio, and scattered it in the gutters running in front of Bureau Amsterdam. The blossom, which in the meantime has been blown around, still links the work inside with Regnerus's 'spring ritual' outside. A little further into the space is Villevoye's video Korowai Walk (1998-99) in which he zooms in on the feet of one of the men from the Korowai tribe who walked ahead of him on a trek through the tropical rainforests of Irian Jaya. The Korowai sing while they walk to keep spirits and rhythm up, but also to announce their approach to anyone or anything else that may be in the forest. The movement of the forward motion and the sound of the video lead the viewer further into the space. Villevoye's work has become increasingly more concrete over the years. In his paintings he sought the borders and the transgression of the borders of modernist views of painting. In using camouflage and skin coloured make-up, which inherently bear social and political meanings, he drew his work further and further into (multicultural) reality. However, in his view, something always remains out of sight in painting: his experience of the world and his meetings with other people through whose eyes everything changes. These thoughts led Villevoye to shift his artistic practice to the world beyond the studio. He went to India and Irian Jaya and found in photography a visual language that is direct, close to reality and through which his personal experience could resonate. This medium also enabled him to 'mix' his own (visual) culture with other (visual) cultures. Villevoye appositely rendered the various meanings of 'mix' in the title of a work from 1993-95: Mapping Matching Mixing Mating. In the exhibition at Bureau Amsterdam, Villevoye is presenting the photographs 31 December 1999 (1998-99) and 1 January 2000 (1998-99) in which he brings two experiences of time together. The titles refer to the turn of the millennium, which only exists within the Western chronological division of time, while the tranquil images of both photographs conceptually question this promise of 'renewal'. A cultural meeting also takes place in the work 31 December 1999, where colour has been taken as the starting point. The work shows the feet and legs of three Papuans standing on three pieces of coloured paper: yellow, magenta and cyan. These, the primary colours of reproduction - and colour photography - optically merge in the photograph with the Papuans' skin colours, leading to formal, analytically and more socio- politically charged meanings that shift across each other. Moreover, the three pieces of paper being trampled into the mud generates an iconoclastic image. Villevoye is also exhibiting T- shirts, which were worn by people in Irian Jaya and whose presence the shirts bring closer by. The T-shirts have been deliberately reworked with decorative holes and tears. Irian Jaya's climate makes wearing clothes against the cold superfluous. The wearing of textiles is therefore something special, providing people with a new figure and the opportunity to distinguish themselves from others. Some of these old T-shirts have generated a completely new fashion through being torn and tied together again, as can be seen in the eight photographs of people wearing their own reworked T-shirts. Villevoye has printed a photograph of the work Returning (1992-97) in this Newsletter. In two of the photographs, a man from Irian Jaya is wearing a T-shirt in which Villevoye has punched twelve holes. These have been encircled by different tones of make-up. The white shirt contrasts strongly with the man's dark skin. In the two other photographs, Villevoye presents the 'negative', in which the artist is wearing the returned T- shirt. The shirt is extremely dirty and the dark brown colour contrasts with Villevoye's white skin. This cyclical movement of time and place can be traced throughout Villvoye's work. In the back room of Bureau Amsterdam, Villevoye is presenting two bill-boards made by Indian painters and two videos documenting its creation. In 1998, Villevoye and the artist Tiong Ang visited the rapidly disappearing painters' studios in Bombay where the billboards for the Bombay film industry are still hand- painted by craftsmen. At one of the studios, Villevoye commissioned the billboard Kovalam Hairdo (1998) to be painted after two personal photographs of his wife, taken while she was having her hair done by an Indian friend in Kovalam in Southern India. Villevoye had the second billboard, Taxi Girl (1998), painted from a photograph taken of an Indian girl looking at him and his wife through the window of a Bombay taxi. He placed both these billboards in Bombay for a day where, just like real billboards, they fused with visual activity of the street. By placing them in Bureau Amsterdam, Villevoye is introducing them into the context of Western art. Here the bill-boards are hung opposite each other in close proximity to the videos. The video Bombay Taxi Girl (1998- 99) shows the billboard of the same name being signed with the name of the studio 'Art Home' and placed somewhere in Bombay. 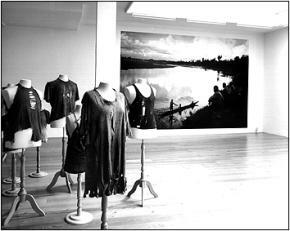 On two monitors, the video Bombay Rushes (1998-99) shows how several artists and assistants worked on the billboard Kovalam Hairdo. The second monitor plays the same recording, only it starts halfway through the first. Here too Villevoye invokes an experience of time and there in an intrinsic experience of place. Once again different visual languages and meanings are mixed in his work. Photographs are translated into billboards, which are actually paintings. Personal snapshots are blown-up and placed in the public realm of the street and, in the idiom of Indian painted advertising, are furnished with a filmic quality through which photographed reality is transformed into fiction. Like Roy Villevoye, Jannie Regnerus's point of departure is also a reflection on painting. Regnerus originally wanted to study theatre design at the art academy in Maastricht, but in the end decided to study painting, which she continued at the Rijksakademie in Amsterdam. Over the years her work has increasingly taken on a physical form. On the one hand through translating her activities as a painter into rituals which she performs in the landscape, for instance, by 'decorating' trees with coloured ribbons and paper streamers. On the other hand, with an ironic glance at the notion of 'autonomy' within modernist views of painting, she has emancipated painterly layers by literally turning every layer into aseparate work. She now turns the figurative elements she previously painted onto canvas into such objects as papiermaché theatre spotlights and a prompter's box. Painterly decorations become strings of blossom-shaped pieces of paper threaded together to produce an optical mix of colour. Regnerus hangs these paper streamers in the corners of rooms so that the ceiling and floor, as well as the walls, become the support for the work. Only thinly painted colour fields remain on the canvas, which Regnerus compares with the backgrounds in Japanese woodcuts. The extremely concentrated way in which the diluted pigments have been applied lend the paintings a radiant quality. In 1998, Regnerus went to Japan where she became fascinated by the way the Japanese use paper in their rituals: folded pieces of paper are hung in trees, or pieces of paper that have been written on in invisible ink are placed in water to make them legible. Regnerus recognized her own 'spring ritual', which she had first performed in 1997, in Japanese theatre where the scattering of blossom on the stage symbolizes the beginning of the new performance and the welcoming in of a new season. During a stay in Mongolia, she discovered in the landscape of the Steppes the stillness she seeks to achieve in her work. Here she became acquainted with such Mongolian rituals as the hanging of scarves and strips of fabric in sacred trees. In Mongolia, deprived of painting materials, Regnerus performed her painterly acts in the open air. In the work Clouds on a Stick (1998), she carried cardboard clouds mounted on sticks out into the landscape. Later she performed a similar act on the Waddendijk in the Netherlands. She documented these activities on film and in photographs, which show how the 'clouds on a stick' also become empty speech bubbles when she carries them. Just like a cartoon character, she carries unspoken words with her. The work articulates a sense of irony towards the traditional genre of landscape, while also referring to the twentieth-century, modernist view of painting as a flat surface. 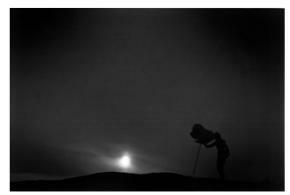 In front of the camera, with her flat, cardboard clouds, Regnerus searches the three-dimensional landscape for a two-dimensional image. In the exhibition at Bureau Amsterdam, Regnerus has combined the various elements of her work and presented them in groups. In one corner there is a green painting and a painting with a yellow mark. A long row of papier-maché spotlights on the ceiling links this corner with the one opposite. Here Regnerus has hung a painting in which a blue underlayer filters through a pink surface. The edges of the canvas have been painted fluorescent orange, enhancing the radiance of the colours. Seven clouds on sticks lean in layers against the other wall alongside a second painting, which is based on the image of daybreak seen from an aeroplane. In the corner hangs a streamer and on the floor is a small podium derived from the red-and-white striped ones which Chinese policemen stand guard on. Regnerus's podium is far too fragile to stand on: the top is made from semi-transparent paper resting on a chicken- wire construction. The sides, made from strips of white and green crêpe paper, flutter at the slightest breath of wind. Around to the right in the exhibition, Regnerus is showing a papier-mâché prompter's box facing a painting of 'curtain lines' in blue-green paint strokes. In the corner hangs a green paper streamer and short documentation films of four outdoor performances are projected on the wall. Like her photographs, these films link the elements present within the exhibition space and the actions she performs outdoors. One of the films shows how Regnerus translated the white painting with the yellow mark in Mongolia by placing yellow dots in the snow. In both works the yellow mark or dot becomes both image and after image. If we look at the white surface for a long time and then close our eyes, a similar yellow mark remains imprinted on our retinas. The yellow dots in the snow provided another point of departure for subsequent work, for instance, the piece in which she places white, cotton squares under an apple tree. Taken as a whole, all the elements that Regnerus has present ed in this exhibition form what she calls 'one-person theatre', which extends beyond the studio to the world outside. The presence of the viewer is an important part of the work presented here by Regnerus and Villevoye. Jannie Regnerus features in her own photographs and films as a neutral figure who, always dressed in the same white shirt with yellow dots, performs small-scale rituals. The artist withdraws into the role of a 'silent narrator'. All her work exudes a sense of quiet. In Roy Villevoye's work, the artist is present in the gaze he directs at the people he meets in India and Irian Jaya through the camera. The title Passing Time that Villevoye has given this exhibition of his work, also refers to his view of artistic practice. For Villevoye, art is a means for finding life and life conversely offers him art as a way of releasing himself from the economic production process that the West is subjected to. Regnerus's work emanates an air of temporality because its meaning too is found in the act of the artist.